The Alachua County Library District invites the community to celebrate 150 years of freedom and commemorate the end of slavery at the 8th Annual Juneteenth Celebration on Saturday, June 20, from 11 a.m. to 3 p.m. at the Cone Park Branch Library, 2801 E. University Avenue. This year marks the 150th anniversary of Juneteenth, a day or recognition and celebration of the end of African American slavery in the United States. This spirited community event features music, exhibits, food, refreshments and door prizes. This celebration shares the history of Juneteenth from June 19, 1865, when the news that the Civil War had ended and all slaves were free finally reached Galveston, Texas. That was two and a half years after President Abraham Lincoln signed the Emancipation Proclamation on January 1, 1863. Annual Juneteenth celebrations began in Texas and slowly spread across the country. In 1980, Texas became the first state to establish Juneteenth as an official state holiday. Currently, 36 states recognize Juneteenth as a holiday or day of special observance. 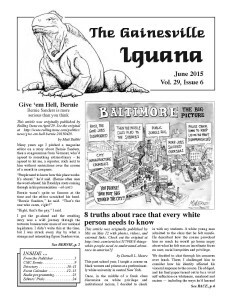 The June 2015 issue of the Gainesville Iguana is now available online, and it’s got lots of good stuff (Bernie Sanders, an oral history interview with David Barsamian, a Florida Legislative update from FL NOW, a Sleep Creek Lands/Adena Springs report, and more!). You can also pick the issue up at any of our distribution spots, which you can find here. Youth Climate Strike: Why me and why now? 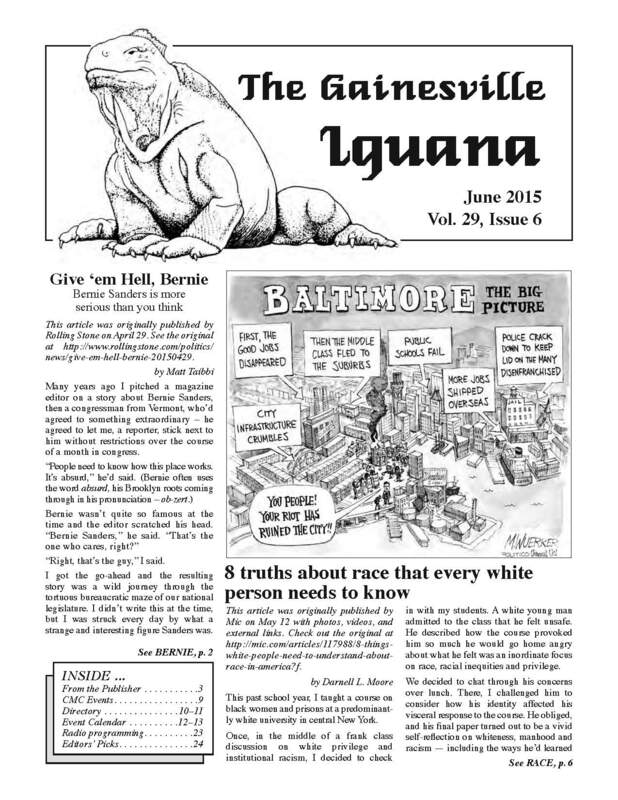 The Gainesville Iguana is a semi-monthly progressive newsletter and calendar of events which first began publishing in October 1986. Through its calendar, directory of organizations, and content, it fosters the growth of movement consciousness and community organizing on issues from local to international.